We just received this set, after having a patio done in our backyard. All arrived only a few days after ordering. It is a very nice set. We like the colors. Photos actually match real close what you will receive. I took some photos how it came out after assembly. Assembly was straight forward, took some time for the entire set, but not a big deal. It is our first Santa Rosa style set, so I can't compare to previous experiences. We give this set 5 stars. It is comfortable for patio use, the shipping happened fast, the packaging was well done. Communication with the mfr is great as well. I had a question about the shipping and received immediate reply/attention. This purchase was a pleasure. This chat set is a great addition to any patio. Each club chair comes complete with its own ottoman and the 3-seater sofa is spacious enough that you do not really need an ottoman. This set also features a tempered glass top coffee table, perfect for placing all of your drinks and cake plates. 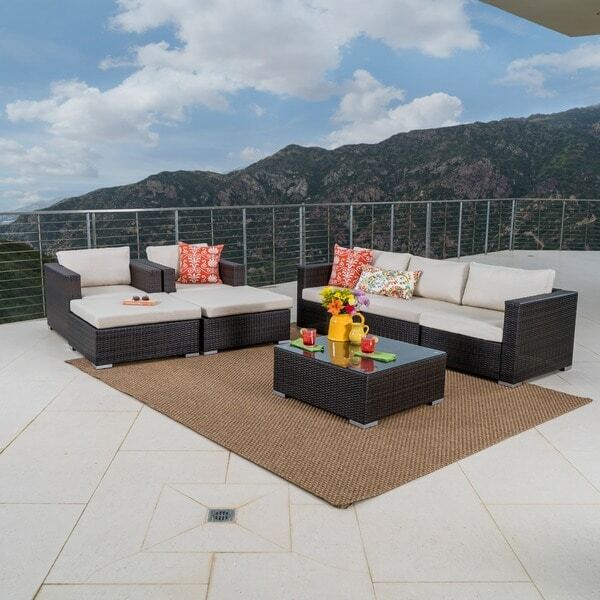 The entire set is made with top quality wicker and features an aluminum frame and water resistant cushions. Enjoy this set for years to come. Dimensions 33.0 In. X 28.0 In. X 15.0 In. Great outdoor set. Easy to assemble just takes time. Seats stay together even without using the clips Seat have right depth and padding. This set is beautiful. I am so happy overstock damaged my other set in transit and ended up with no more in stock. This set was twice the price but 10 times the quality! The set up was a bit annoying because we didnt have a bit for our drill for the larger head size so it was all by hand. The cushions are comfy, furniture is sturdy and the colors are beautiful. This set is gorgeous. I am so happy with the quality of it. We had a backyard bbq for father’s day and everyone was commenting on how nice the set was...this was just what we wanted...it makes our backyard looks like a resort. It’s comfy and a nice size...not too low like some of the other sets we viewed. I would absolutely recommend this set. I love this sofa. They look very expensive, are well made. Feel comfortable to sit, cushion is perfect. Thia cushion is beyond my expectation !!! Arrived extremely fast via Fedex in 7 large boxes. A couple of the items required some simple assembly. We are very pleased with quality of the product. Cushions are very comfortable. Nothing negative to report, everything was exactly as expected! This was the second sectional we bought for our patio since we liked it so much on our deck. Arrived quickly and exactly as described. It does take a little time to put together, but you just have to be patient. We love it! "What are the dimensions of the 3 seat sofa?" The dimensions are 33.25 inches L x 89 inches W x 24.40 inches H.
"Is there a cover set for this product?" "Does the table have storage underneath it?" "Is the fabric sunbrella and is the frame powder coated?" Yes, the fabric is sunbrealla and the frame is powder coated.